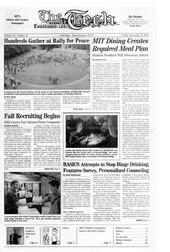 “The decision has been made by the Institute to move to a participatory meal plan,” he said. A minimum level of participation in such a plan would be mandatory for all undergraduate dormitory residents, but the details of possible meal plan options are yet to be finalized. This reformulation of the dining system comes as the current contract with Aramark is set to expire at the end of the year. 160 companies braved a sluggish economy to attend this year’s career fair, which will end today. The program gives all freshman the chance to submit a nine-question online survey on alcohol consumption, and pays them $25 in return. Based on their answers, they may then be asked to partake in two voluntary counseling sessions offered by MIT Medical. In his address, the Lemelson prize winner and Kurzweil Technologies founder highlighted the importance of innovation in a society where technology improves at an exponential rate. The auditorium was packed past capacity with eager future business leaders undaunted by terrorist attacks and a floundering economy. Larry Anderson, MIT’s director of club sports, said that the creation of the Council came in response to cutbacks and restructuring within MIT’s Athletic Department and the ASA over the past year.